The fiery temper of the cowboy caricature Yosemite Sam is matched by his flowing, flame colored facial hair he’s sported since his 1945 debut in the animated short Hare Trigger. For decades, children have been endlessly amused by the diminutive cowpoke’s antics; however, there are some valuable lessons to be learned from Yosemite Sam. Here are ten of the things that kids can pick up from a Saturday morning’s worth of vintage cartoons. Big Things Can Come in Small Packages – Despite being a pint-sized specimen, Yosemite Sam packs a cowboy’s punch when it comes to his temper. Watching him in action is a great way for kids to learn that little guys can have a lot of attitude. Anger Makes You Careless – During Sam’s trademarked temper tantrums, he’s prone to fits of reckless shooting whenever he’s upset. Despite the number of bullets he fires and the impressive volume of his shouting, he never manages to strike a single target; his rage keeps him from focusing on the task. There’s Nothing Nice About Racism – Yosemite Sam’s blind hatred for Bugs Bunny can be seen as an allegory for racism, albeit an unintended one. Kids observing his senseless pursuit and desire to harm Bugs simply for being a rabbit are afforded an easier-to-understand version of this concept. 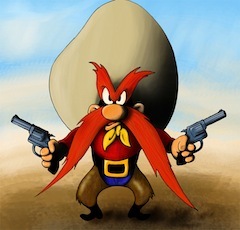 Pigeonholes Can Be Difficult to Break Out Of – Despite being cast over and over again in “fish out of water” roles, the content of Yosemite Sam’s character never changes. He’s always an angry, careless cowboy prone to violence; kids can easily see from watching these stories unfold that extricating yourself from a pigeonhole can be easier said than done. We Have to Learn From Our Mistakes – Though he certainly has plenty of character flaws, one aspect of Yosemite Sam’s character that kids can take away from their viewing experience is that Sam never falls for the same trick twice. He might not be the sharpest tool in the shed, but he certainly learns from his mistakes. Over-Confidence Can Be Dangerous – Oftentimes, Sam is done in more by his own cockiness than anything else; his unwavering confidence in himself crosses the line between “healthy” and “unrealistic,” leaving him slightly less than capable of making good decisions regarding his abilities. It’s Not Wise to Accept Every Challenge – On more than one occasion, Yosemite Sam has been defeated by his own inability to turn down a challenge. Enemy Bugs Bunny, knowing this about his rival, will dare him to “step across that line;” Sam can’t help taking that step, but it often leads to him plummeting over a cliff or into other physical danger. Ill-Gotten Gains Are No Prize – One full-length feature saw Sam gambling large sums of money and then stealing the sports car belonging to a professional race car driver in a bid to catch DJ Drake and Daffy Duck. However, his ill-gotten gains don’t benefit him much; the car crashes into the wall of Sam’s own casino shortly after he takes it. A Bad Attitude Can Become Your Trademark – Anger and surliness are such an inextricable part of Yosemite Sam’s character that he’s been featured on merchandise showcasing his lack of manners. Watching Sam become synonymous with “rude” is a great way for kids to learn that a bad reputation can be difficult to shake. What Goes Around Comes Around – Yosemite Sam is an unrepentant outlaw; from his black bandit’s mask to his affection for a good alias, he does very little to conceal this fact. However, kids watching Sam certainly don’t find the Old West Outlaw character glamorized in Yosemite Sam; he is consistently defeated, usually by his own devices. Yosemite Sam definitely provides the traditional lesson that ‘crime doesn’t pay’ through his cartoon character. It may seem a bit old fashioned, but it is still an important lesson for every child to hear.